What I find fascinating about anonymous portraits is the imaginary life we create for those captured for but a moment in time. I've often wondered about the woman in this portrait. I imagined her to be the eldest daughter of three, living on a grand estate and wearing beautiful dresses. I wondered if she was happy and if she lived a long life. I hoped so. Romona, a library acquisitions assistant, wrote me recently after coming across a familiar face. She traced the familiarity back to the post I did on the woman in the portrait...it was, indeed, the same woman. Her name was Enrica Soma, the mother of actress Angelica Huston. On June 9, 1947 she was featured on the cover of Life magazine, identified only as "Young Ballerina." She was the fourth wife of famed director John Huston. Shortly thereafter, she became the mother to three children. A son named Tony, a daughter Angelica and her sister, Allegra. Many years later in Italy, while driving to her father's house for the holiday, she died in a car accident. She was just 39 years old. Her youngest daughter Allegra, who was four years old at the time of her mother's death, has written a memoir called Lovechild. Of course, I see the portrait differently now. Knowing more about the woman behind the face is bittersweet. She did not live a long life as I imagined, or hoped. In fact, she died at my age. But despite the tragedy that greeted her in her young life, I find myself with an even deeper respect and appreciation for her grace, her beauty and her mystery. And in this portrait, it is the life she lived passionately as a ballerina, and her beauty and presence as a mother, that endures. So glad you found out more about the painting and that it deepened your appreciation of the woman and her portrait! So amazing that you found out who she was! What a touching story. I can't get over that someone made this connection. It's absolutely incredible. The portrait is perfect. The only difference is the necklace but I notice now, for the first time, that the portrait is unfinished. Perhaps it's the artist's statement of her unfinished life. Now we need to know who painted it. I love the power in blogland and that one of your readers connected the dots..... fascinating! Mystery solved and how interesting! Her eyes look a little sad to me but her smile seems genuine. This is fascinating. And I agree that you have a very astute reader! Life goes wondrous way sometimes. This painting spoke to you when you first bought it and now not only did it reveal its story and the person, it also reverberates new meaning. Stories come from many places, this is an amazing one! Being painter myself portrays are dear to me and like Low Tide High Style I find it always sad, when I find a portray stashed away somewhere, unloved. She was a pretty young woman with a tragic end!This painting certainly will keep her memory alive! Also I like your generation photo! Wonderful! What an interesting story worthy of the Antiques Road Show. 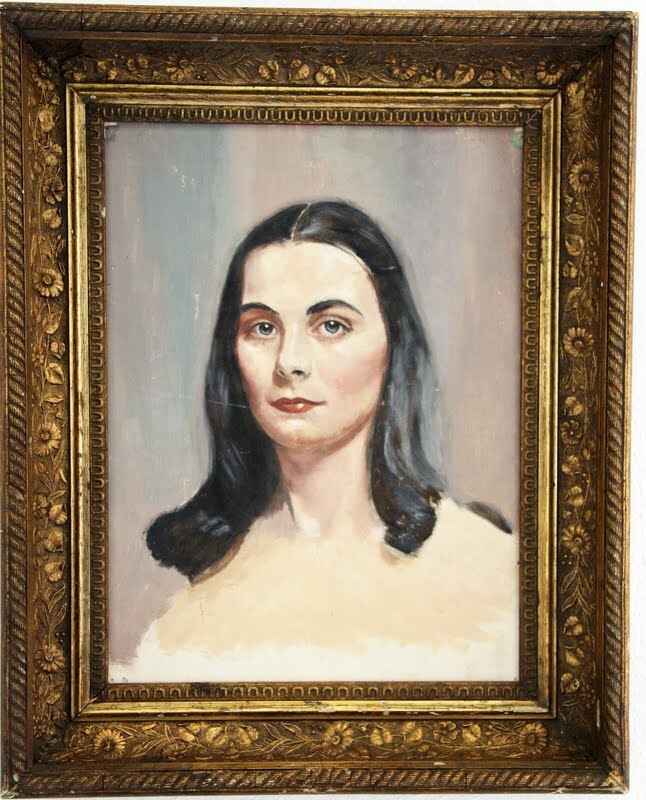 You may not want to give it up, but I wonder if Angelica Huston would want to have this portrait of her mother? I found this story fascinating. I am an artist that often uses magazine images for models. This portrait is lovely. I agree with Steve that it is unfinished ( the hint being it is not signed). Stories like this make blogging so interesting. wow, this is so fascinating and exciting. i love angelica huston too. what a great actress and what a great story. Wow, the Internet never ceases to amaze me. We have crazy information at our finger tips . A voice was familiar to me on a commercial and I googled it . Within seconds I had my answer ,Campbell Scott. What a lovely end to the mystery. I am sure you will cherish it! I think it speaks of how women connect to others women for strength. She embudes a melancholy soul but must surely be happy to have landed in your home to be admired and cared for, without any sort of judgement. Very interesting and such fun that you actually got your hands on that Life cover to solve the mystery. That's really beautiful! What a fun discovery. Such a lovely tribute to her and to all women who grace our lives with their beauty and presence. Thank you for this post. Now that I know the history, the resemblance to Angelia Huston is undeniable. Here is the source of those famous cheek bones! Oh that is so nice, I LOVE history!! Thanks for sharing. What a lovely connection to a lovely young woman who died much to young. I don't believe in coincidences--I believe God has dotted all the I's and crossed all the T's. He arranged the two disparate pieces to meet. People don't realize it, but librarians rock! What a wonderful relation you now have to that painting. Wow, this is an amazingly beautiful story. How lucky you are to find the name behind the face. Thanks for sharing. What an incredible bit of luck that someone recognized the mystery of your portrait. This brought tears to my eyes Trina...lovely that you now know who she is...what a sad story though, I never knew that about Angelica's mother. Very cool! Where did you get the portrait? You know, she kind of looks like she could have been one of your relatives! You just started my day out so beautifully which is such a nice thing to do! Thanks for sharing this! That portrait was always a great find. Discovering who she was is almost a greater find. How often can we identify an anonymous girl like that? Maybe it will happen more easily from now on, in this age of easy photographs and instant internet research. In any case, beautiful girl, beautiful painting, beautiful story. How interesting to have discovered her "real life." That's what I love about art-- how your perspective and views can change so much by learning the context and background of a piece! Aren't connections like that *so* fascinating? Wow, that is so neat.......what a beautiful portrait! this remined me of the portrait I made when I was a teen in a art class.. my lady had green hair (it WAS the 60's) But, cool story behind this portrait I must say! Lovely post and a nice bit of research. Hopefully Ricki's story doesn't tarnish the way you feel about the portrait. How fun to learn the history behind the portrait! She was gorgeous and really dignified. It's indeed sad to hear she died young but it sounds like she got to pursue her passions and talents! The painting really seems to capture the essence of her persona. a) this story gives me goosebumps! b) your antique store find is suddenly worth a bit more, i'm guessing! 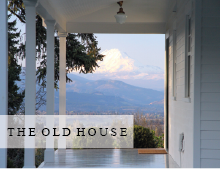 Miss your posts about the farmhouse. So, I'll sign off for a while . . .
Wow. That's a sad story but an amazing discovery. I often think similar things when I come accross portraits while I'm antiquing. I've never been lucky enough to figure out the real story though! Wow! How absolutely incredible that you've traced the history of this woman. A life, and a painting, unfinished. I love how you've written about her...and I love her presence and inspiration in your home. Perhaps she found you at the antique store! What a interesting portrait, and such a beautiful woman. It's amazing how we imagine a person through a photo, and yet somehow we are partially right about that person. What a beautiful find and story to the portrait. Does this little bit of information now make you want to know more? Yes, in fact I ordered Allegra's book Love Child. What I've found most fascinating is seeing pictures of her with her family. It does bring a whole new life to the portrait. Reading this post literally gave me the proverbial "goose bumps"...for it seemed to me that the portrait resembled the actress Angelica Huston. Then I read a little further...to discover that was true. How sad to have died so young. 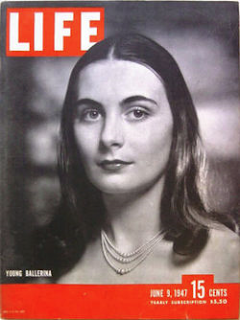 I just ran across a copy of LIFE magazine with Angelica Huston's mother as a young ballerina, and I immediately thought of your painting. I would never have known the connection otherwise.